To pack now or to pack later? To pack fast or to pack better? Packing up your classroom is a highly personal choice. I believe it is a choice that should be made with care. What are you doing next year? The answer for when and how to pack up is definitely different if you are staying in the same space and teaching the same thing than if you are leaving your position, moving to another classroom, or teaching something new. How much of the stuff you are packing belongs to you? The district or school can dictate many things. What you do with your private property is not one of them. Those items that are personal can be brought in and out whenever you want with one caveat: student learning must remain your priority. What does your administrator want and expect? Is s/he more concerned with getting everyone checked out quickly? Or are they likely to take a negative view of packing up early? 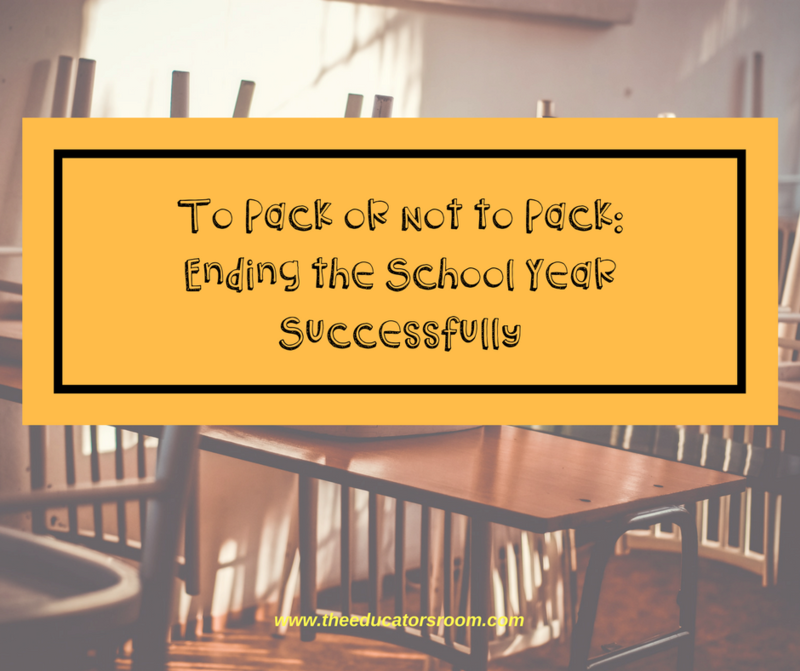 How will packing impact your students? Will packing disrupt the classroom environment in a way that will harm learning? Are your students looking for any excuse to check out? Or will easing into the change help them adjust to living without you and your classroom every day? How much stuff do you have? Many teachers are natural pack rats and need to determine what can be discarded at the end of the year. Others prefer an uncluttered environment and purge as they go. Where will your classroom materials be stored for the summer? Can you leave your boxes in your classroom? Does everything need to be moved to another space or even to your home? What does finish strong mean to you? How do you inspire students to keep learning and trying right up until the last minute? How will your packing influence your ability to help students end the year on an academic high? How do you feel? If you have strong beliefs about when to pack, follow your heart. Letting others influence your decisions probably won’t help you or your students. When in doubt, go with your gut. The end of the year is stressful for everyone. You have a professional responsibility to pack up, to finish strong, and to do what is right for you to come back another year and do it all again. I don’t think there is a right or wrong answer about how to get everything put away for summer. But there are a lot of opinions. As long as the students’ ability to learn effectively is not disrupted, who cares? Unfortunately, the answer isn’t always no one. Some administrators take early packing up as a sign of having checked out of teaching for the year. These administrators might hold strong personal beliefs about this issue. Or they might be looking for negatives to exploit. Some are adhering to or enforcing rules from on high. No matter the motive, if your administrator disapproves of early packing, it is in your professional best interest to tread lightly. That doesn’t mean you can’t start organizing and packing. It means you can’t do it in a way that would be noticeable to a relative outsider. Students and parents can also be upset by early packing. Especially for younger students, ending the year can feel pretty traumatic. It is a major shake-up in young lives, after all. And for those children and families that depend on you for emotional support as well as academic support, early packing can trigger feelings of abandonment. If packing early is a need or preference for you, it is probably a good idea to be sensitive to the impact on your neediest little ducklings. Other teachers can also have strong feelings about early packing. For years, teachers I worked with berated me for packing late. There were two main reasons. One reason was a feeling that my choice made them look bad. Somehow, my tendency to pack late made them feel like they might be perceived negatively or as inadequately devoted to the job. It is a valid point. Put two rooms side by side the last week of school and the comparisons might lead to false assumptions. I was also told I was doing myself a disservice by using personal time to wind up my year and pack up my stuff. Summers are precious and necessary to recharge for the coming year. So many teachers assume that being away from the building is the best way to energize for another year in the classroom. This is also a valid point. On the other hand, the solitude of packing after the year has ended is a time I cherish for reflection and organization. Recently, a teacher stated that she wanted students to feel the pressure of a year drawing to a close. For her, packing up was a tangible reminder to students that they were running out of time. No more extensions or late work opportunities. That pressure (at least at the high school level) can act as a motivator for students to push for a strong finish with a passing grade. Early packing can also help with effective organization and time management. Others believe that early packing sends students the wrong signal. The year is over and it is ok to quit trying, to shut down, and to give up. Students are more likely to finish strong for teachers they feel are deeply invested in their success. Keeping everything in place until academics are finished can be seen as tangible evidence of investment. I get that. I’ve lived it. This year I packed early. I got to experience the other side of this situation. It was hard for my students to accept the changes. And it did put some positive pressure on them to get things done. My organization suffered some too. The feeling of judgment was there. To outsiders, it looked like I had ended the year early, especially in comparison to other years. Students helped me pack and I think it gave them a sense of closure that isn’t present when the end of the year sneaks up on me, room unchanged. That sense of closure helped some of them let go for the summer, which is also valuable. If you find yourself being chided for your choice, take a deep breath and think about the best response. I always maintained that I envied those who could effectively pack up early. I can see the advantages, but my brain doesn’t work that way and I prefer to pack late. As long as your motives are clear, you can weather any response. No matter what, student learning should come first. For me, ending well influences my whole summer and can carry into the next year. It is up to each of us to find a method of ending the year that works for us, our students, and our environment.